Have you heard? Pinterest is the new front-page search result on Google. Get your cute Valentine’s Day wreath repinned by the right taste maker and you can have a viral craft hit on your hands. And if you’re shaking your head right now saying “Pinterest whaaaa?” check out my post explaining the basics of Pinterest. My favorite feature on Pinterest is the “also from…” option you see when you click on a pin. For example, if you click on a picture of a delicious looking recipe from Tasty Kitchen, in the bottom left hand corner of your screen you’ll see “also from tastykitchen.com”. It’s a great way to instantly get more from a site you’ve just discovered. One of the things I’ve noticed about my traffic is readers often click on the suggested similar posts at the end of each new post. I use the LinkWithin widget to display thumbnails of posts with similar key words and topics. I find myself doing the same thing on other people’s sites and spending hours reading archives and links. I thought it would be great if I could combine those two ideas with a button right in my sidebar . Now you (and I) can see what people have pinned from my blog instantly, plus it’s a quick way to see the best of my crafts and party stuff with direct links back to their original posts without having to search. And because I’d like to see the same thing on YOUR blog, here’s a quick and easy tutorial on how to make a button of your own. 1. 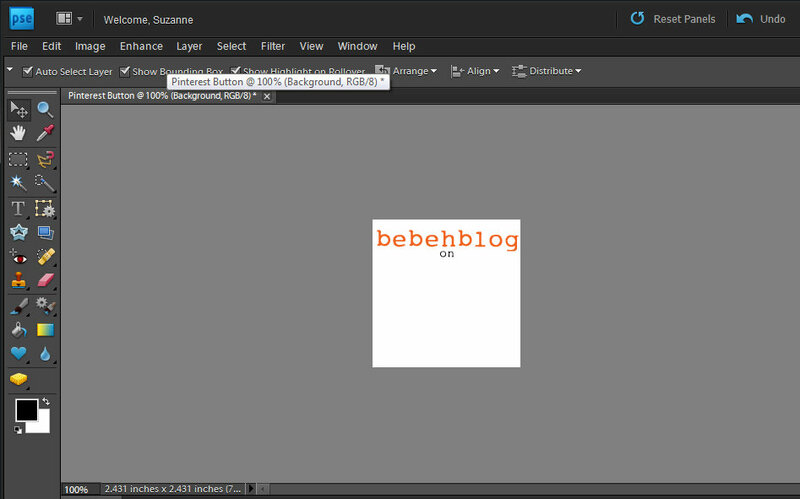 Create a button sized blank graphic in your favorite graphics editor. I used Photoshop Elements, but you could use any program that lets you size the document to 175×175 pixels. Some sidebars are a little smaller (150×150) and some are a little bigger (200×200) so use whatever works best. 2. Add your blog name. I used the color and font from my blog design to keep it recognizable. I also spent WAY too much time choosing a font/size for the word “on”. 3. 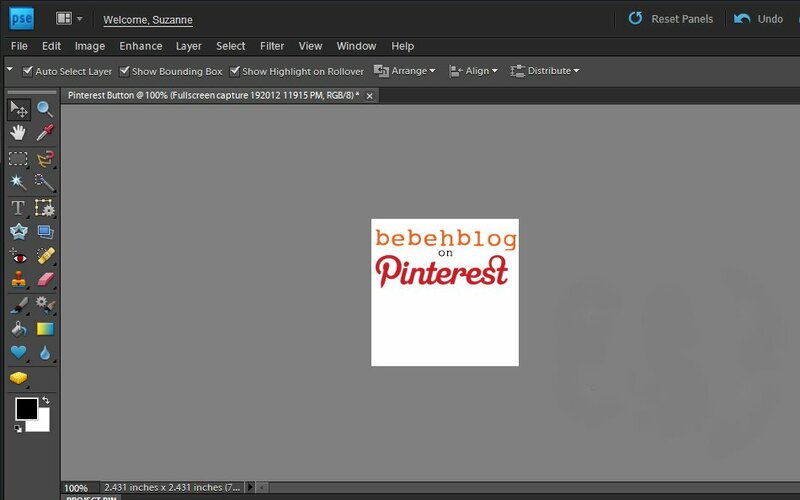 Download the Pinterest logo graphic from their “Goodies” page (it’s at the bottom) and insert it in your graphic. They have two options available, so you can make yours look like mine or use the “P” logo. 4. Add a graphic. 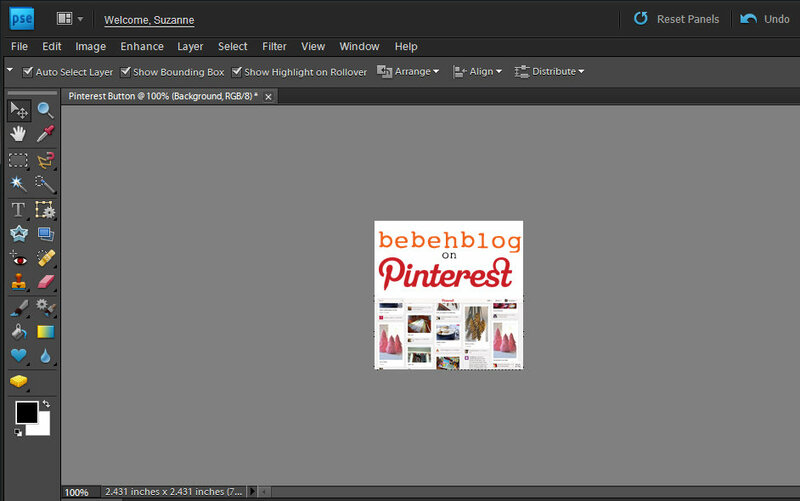 I went to my “stuff pinned from bebehblog” page, took a screenshot and cropped it in Picasa. That way the images in the button are actual pins from my blog. 5. Tweak it – resize your text and graphic, center everything, make sure you like the screen shot you used. I ended up adding a border to mine because it was too white against my background. You want it to be clean and eye catching but not too busy. Save your image as a JPG. 6. 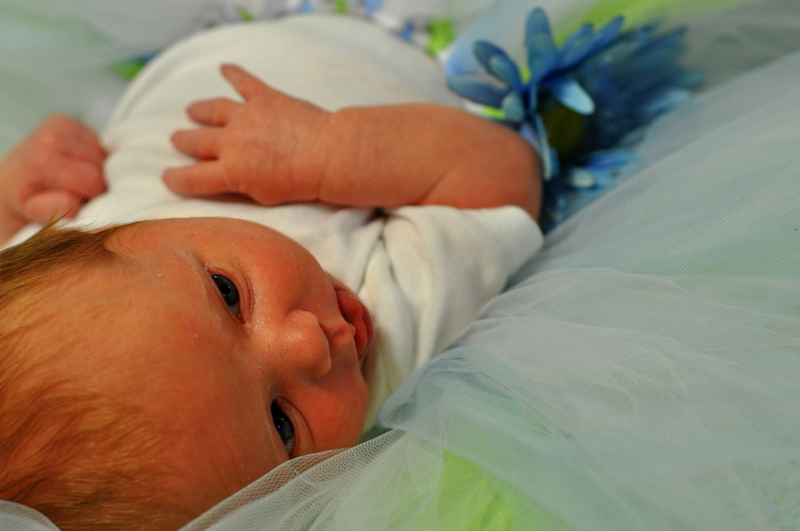 Upload the image to a free photo-sharing site. I like imgur but Flikr and Photobucket are also popular. Find the sharing option that gives you the direct link to the photo – it will start with “http://” and end with “.jpg”. Replace the RED text with your blog address.com and the BLUE text with the direct link to your image. 8. Save the changes to the widget. Refresh your site and you should see your new button! Because the link will update as people pin more things from your blog, you should only have to make one button and the most recent stuff will always show up on top when people click through. Any questions? Feel free to leave a comment or email me at bebehblog@gmail.com and I can try to help. Warning: DON’T READ THIS POST IF YOU LOVE THE INTERNET. Because if you’re as addicted to blogging and tweeting as I am, the last thing you need is another online way to waste time. But if you like: art, food, home decor, dessert, crafts, photography, fashion, happiness, make up, tutorials, jewelry, etsy, joy and being inspired on a daily basis, I highly recommend you get on the Pinterest bandwagon as fast as if your pants were on fire and the wagon was covered in hot firemen. My friend Brigid actually sent me an invitation months ago, because genius that she is Brigid knew it was a brilliant next-big-thing idea and also the sort of something I would love. I should send her a fruit basket. Maybe I’ll go look for creative fruit basket ideas on Pinterest. Because there are probably FORTY BILLION of them. I procrastinated for a few weeks, thinking I’d check it out when I had time and surly it wasn’t some sort of life changing website. IT IS A LIFE CHANGING WEBSITE. The second stage of Pinterest is following other people and their boards, so you can find inspiration right there on your homepage. You can follow all of someone’s boards or just one or two, based on what you’re interested in seeing in your feed. When you click on something that’s been pinned it takes you back to the original website, where you can get the info you need to make/cook/buy/try/read about the thing that was pinned. Home decor, a playhouse, tutorials, crafts, more recipes, things to buy…really, there are PLENTY of things to look at on a minute by minute basis. – DO follow lots of people. The more people you follow the more stuff shows up on your homepage. – DO follow people you don’t know. I promise it’s not creepy or stalkerish, so if you find a board that you’re in love with always add them! – DO repin when you love something. – DO use the search option to find more of what you want. 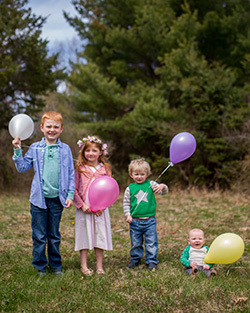 I searched “polka dots” every day for a week to find inspiration for Little Evan’s birthday. – DO check in often. Your friends will go on pinning sprees and looking at several days worth of stuff at once means you might miss something. – DO unsubscribe from a board before a person. Maybe you love your friend’s sense of style but you don’t like pictures of babies or celebrities or quilts. Keep following their fashion board but unfollow the board you don’t like. 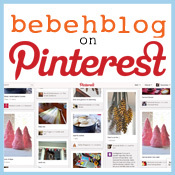 – DO use Pinterest to keep track of stuff you find in magazines. I do this a lot with recipes – if there’s an online version it’s so much easier to pin it than hold onto ripped out pages. – DO check out the “staff favorites” boards and the ones Pinterest suggests you might like. It’s about expanding places you find inspiration, not looking at stuff you’d see on your friend’s blog anyways. – But DO pin stuff from your friend’s blogs when you love it. I’m not going to lie, being pinned feels nice. – DO be my friend on Pinterest! – DON’T just repin stuff from other people’s boards. Add new content to the Pinterest community when you find it online, whether it’s from blogs, shops, websites, or friends. – DON’T pin stuff to multiple boards. Pick the category it fits best and pin it just once. 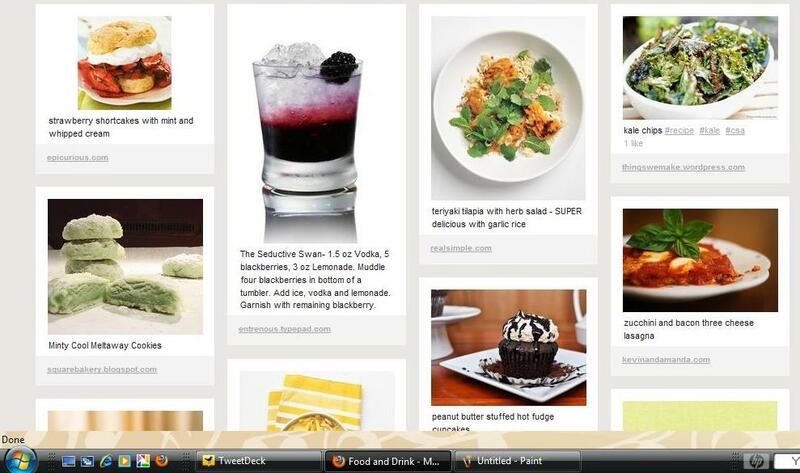 – DON’T forget to label your pins with helpful tags and explanations, especially when pinning recipes. “Yum!” isn’t as helpful as “strawberry shortcake cupcakes”. For stuff from shops, adding prices is nice. – DON’T just pin stuff from your blog. You can pin your own some sparingly, but follow the social media 80/20 rule: Promote other people 80% of the time and yourself 20% of the time. – DON’T think Pinterest is just for bloggers. You don’t need anything besides an email to sign up and you don’t need online friends. – DON’T post EVERYTHING you pin to Facebook or Twitter. I accidentally put my pins in my Facebook feed and was super annoying for a few hours before I noticed. – DON’T forget that just because a picture is on Pinterest doesn’t mean it’s not subject to copyright. You cannot just take and use them on your blog without checking with the owner. Seeing all the things I want to cook/make/buy all at once makes my life so much easier and more organized. I can actually re-find stuff I saw on the internet and thought “oh, I should do that!” Now I CAN do that. I’m also slightly addicted to checking what’s been pinned from my own blog. It’s reaching an unhealthy no-there’s-nothing-for-dinner-can’t-you-see-I’m-busy-looking-at-recipes-on-pinterest-WHAT-DO-YOU-MEAN-THAT’S-SUPER-IRONIC??? levels of time consumption, but I don’t even care. I love it. Are you going to sign up now? Are you addicted yet? Do you have any suggestions for ways to make the most of Pinterest? 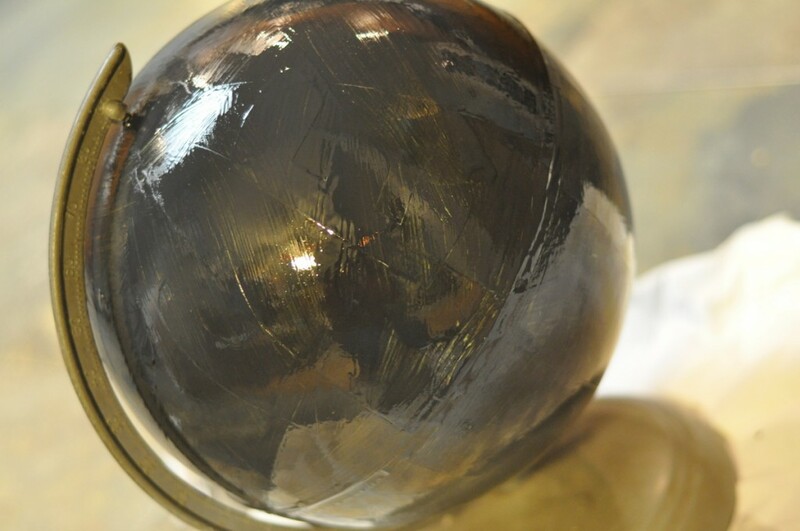 I was daydreaming through the Pottery Barn catalog a few weeks ago and I noticed a solid black globe with chalk writing on it (of course, now that I want to show you I can’t find it online). What is it with PB and their obsession with chalkboard paint? Don’t they realize any idiot can just buy a can of that stuff and paint things with it instead of spending hundreds of dollars on the ones from the catalog? Although I guess the kinds of people who order entire rooms straight from Pottery Barn are too busy playing tennis and vacationing on Martha’s Vineyard and rolling in hundred dollar bills to bother buying paint. 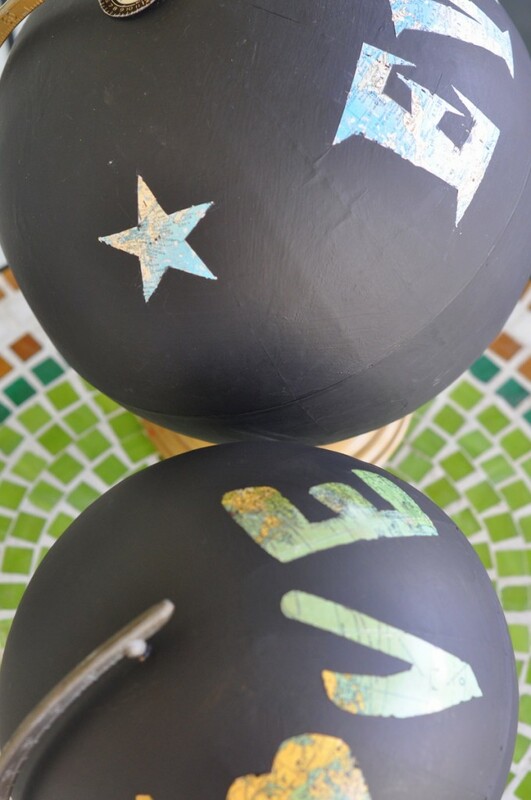 So it’s left to people like me to write chalkboard tray and chalkboard globe tutorials. 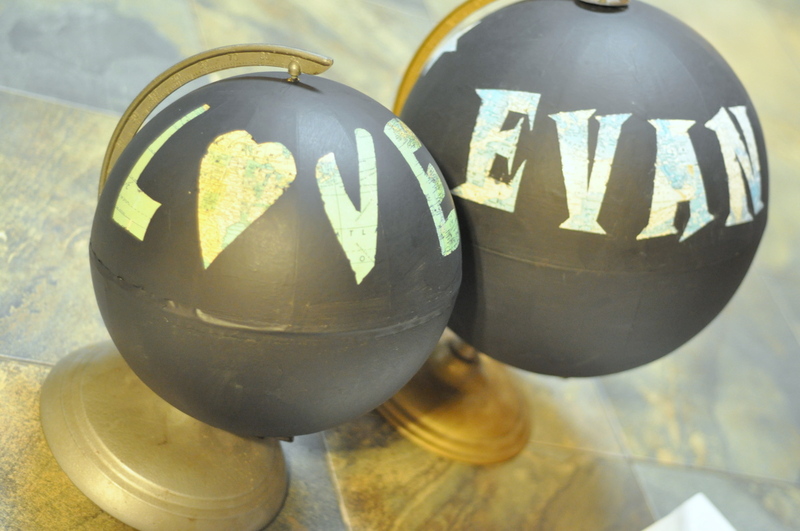 I even fancied the globe up a bit to make it more fun. I am the wordiest, most rambling blogger ever, so to make this easier on people just looking for a tutorial all the REALLY important parts are in bold. Although you can tell it’s not THAT old because Burkina Faso is called Burkina Faso and not Upper Volta (it was changed in 1984). I tried printing it directly onto make-your-own sticker paper (also known as 8 1/2 x 11 shipping label paper from Staples). This didn’t work out so well, as you’ll see that in a minute. 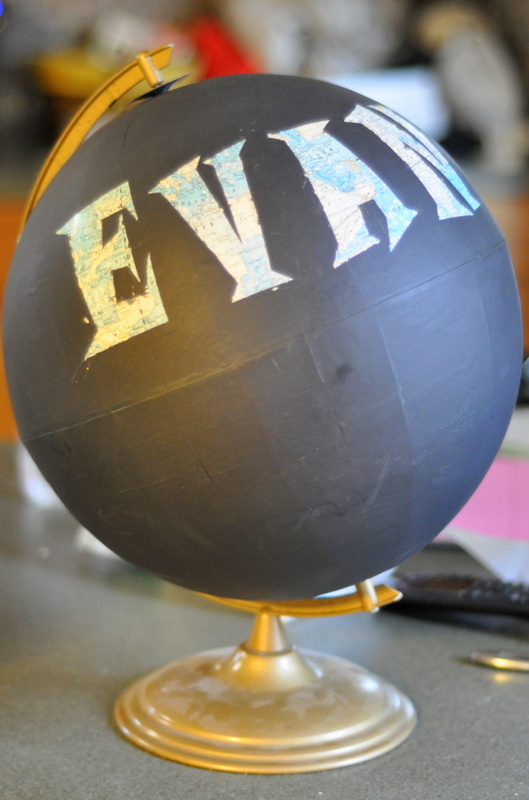 Then I cut out the letters and stuck them on the globe. 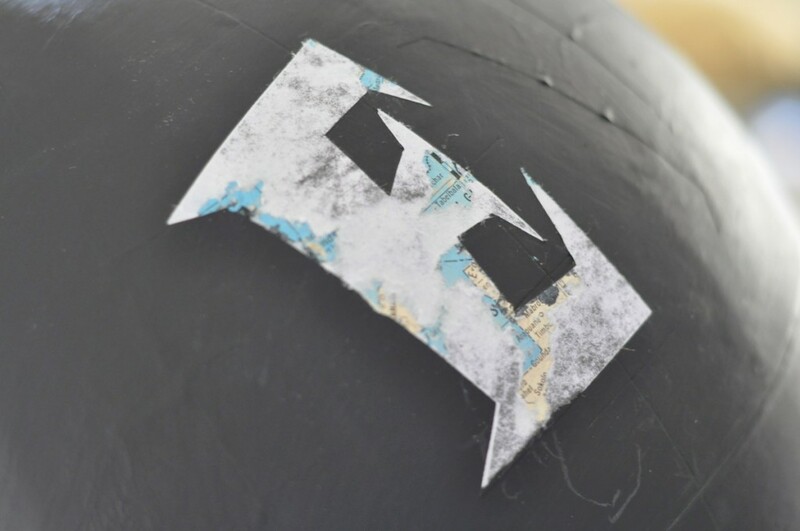 …So when I tried to peel the stickers off the top layer came up but the adhesive stuck to the globe. Using several different kinds of knives (a regular old table knife ended up working best) I managed to scrape MOST of it off and only damaged the map underneath in a couple of places. 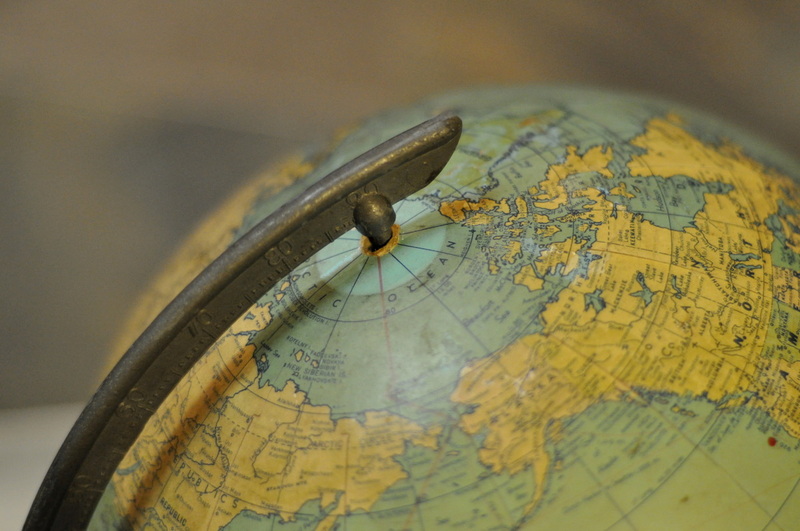 I figured this was my trial run – and the globe I’m going to let my toddler play with – so it’s not the end of the world. Ahahaha! Globe joke!! Luckily I was able to try again. Here’s the way this project actually works best: I used contact paper I found at Target to make stickers. It was with the shelf paper that comes in cute patterns (on the aisle with the mops) but I picked the most basic clear kind to ensure it was just one layer and wouldn’t come apart like the label paper. I printed out the word “LOVE” with a heart for the “O” on regular paper, then traced it backwards onto the paper side of the contact paper. 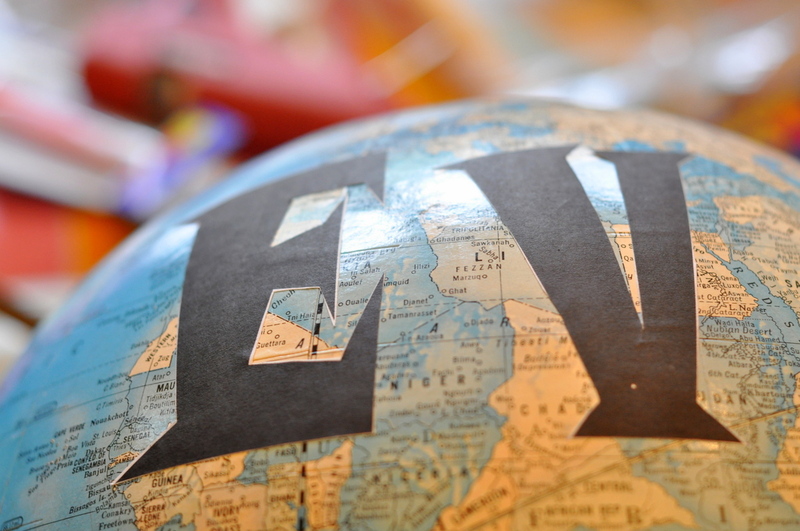 That way when you peel the paper off and stick it on the globe the letters face the right way. 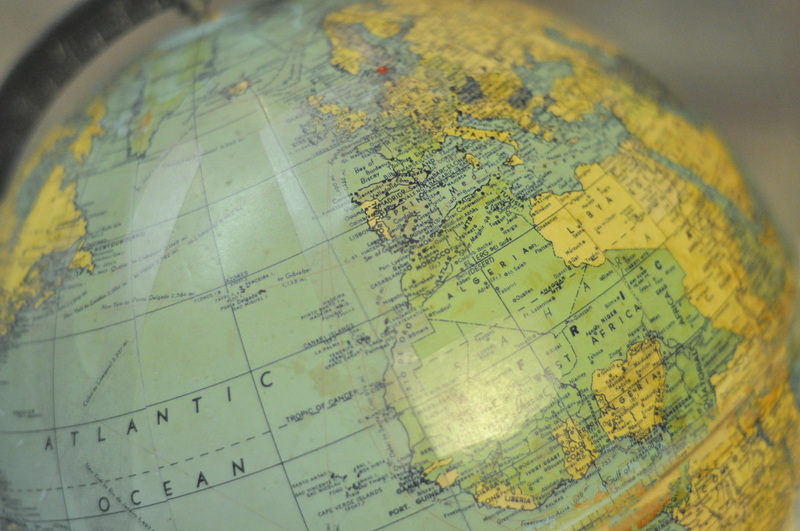 …and peeled off the contact paper to see the map underneath! Is that cute or what? Now my useless dust collectors are cuter, chalkboard dust collectors. 1. Choose a font or shape that doesn’t require a ton of detailed cutting. 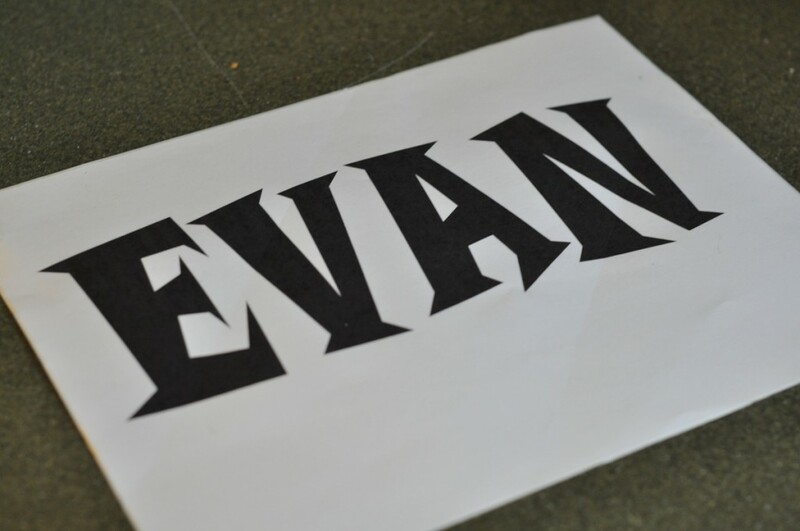 I couldn’t even get the center part of the “A” in Evan to come out right, which is why it’s not there. Besides, you want big sections of the map to show through. 2. 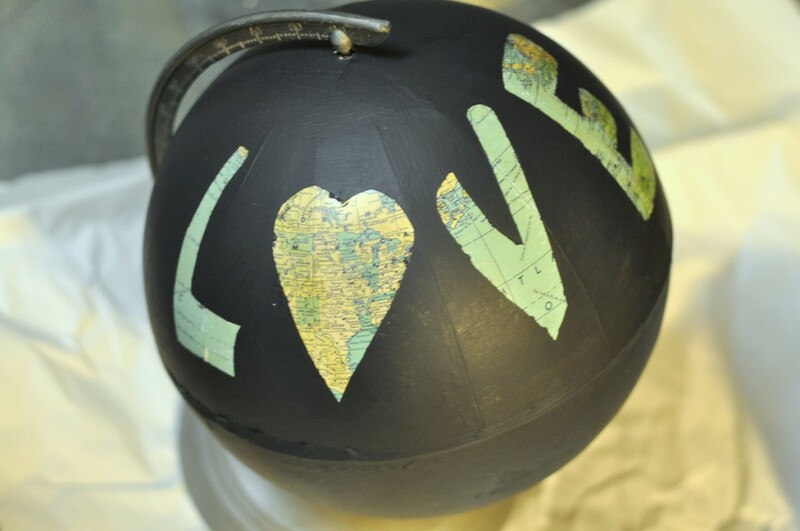 Don’t make your shapes/letters too large or the contact paper won’t lie flat when you stick it to the globe. It’s important to get the edges stuck down really well to prevent the paint from seeping underneath. 3. When the paint DOES get under the contact paper, you can veeeeery gently scrape it off with a blade or craft knife. It’s easiest if you do it as soon as possible, so peel the stickers off as soon as the paint is dry(ish). 4. Be sure to follow the instructions for dry-time on the chalkboard paint before you try using chalk on it, or you’ll end up with permanent marks. They’re not joking about that. 5. 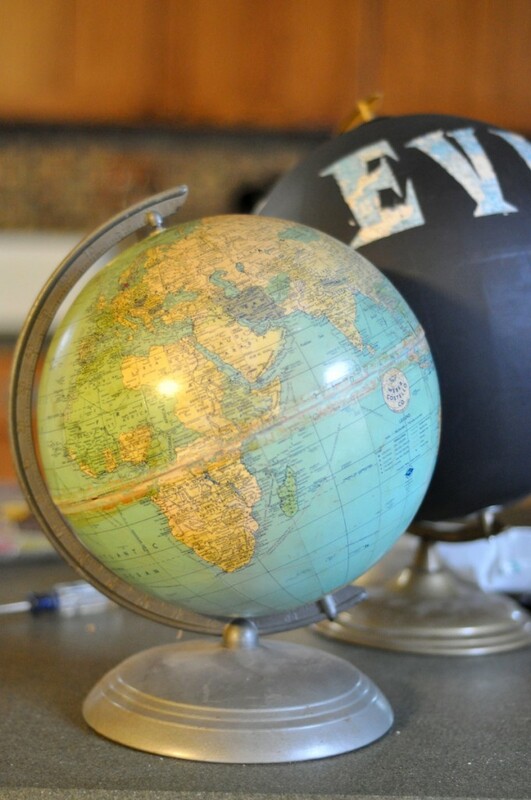 I bought all my globes for mere dollars at our local flea market, which is kind of a lousy flea market but apparently a gold mine for old globes. I’ve also seen them at antique stores but those tend to be a little pricier because they’re in better condition or actual antiques instead of junk. 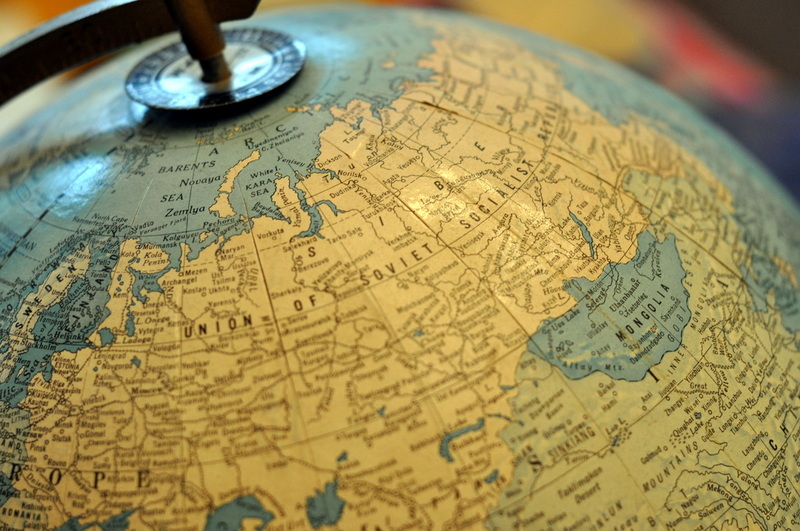 Shipping a globe is cost prohibitive, so your best bet is garage or yard sales or a trashy flea market in your area. Just keep your eyes open! 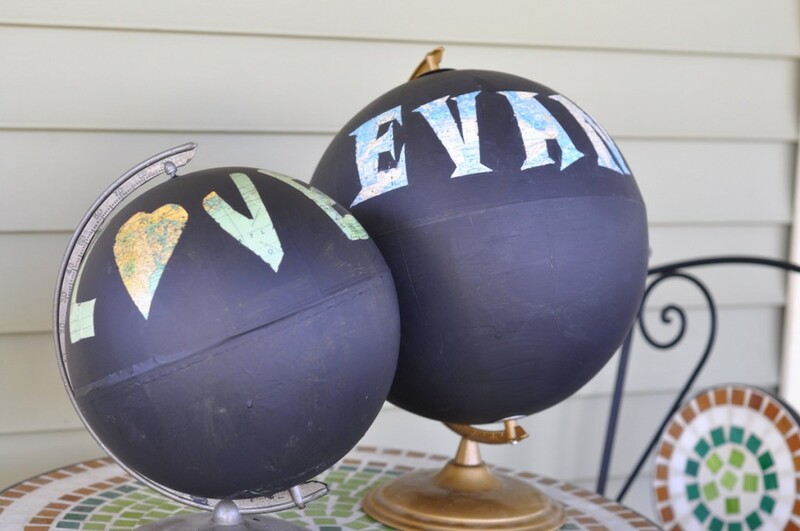 Other cool ideas – just paint the ocean or the continents with chalkboard paint so you can color in the rest however you want. 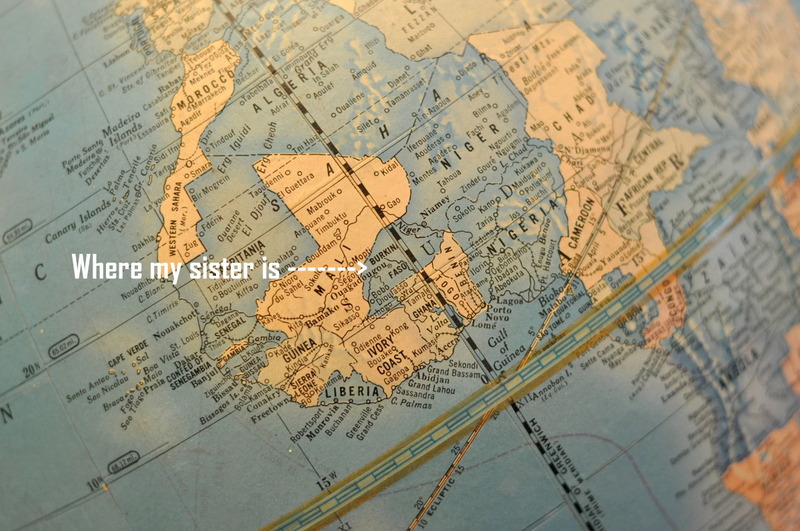 Get really ambitious and outline the continents in another color. 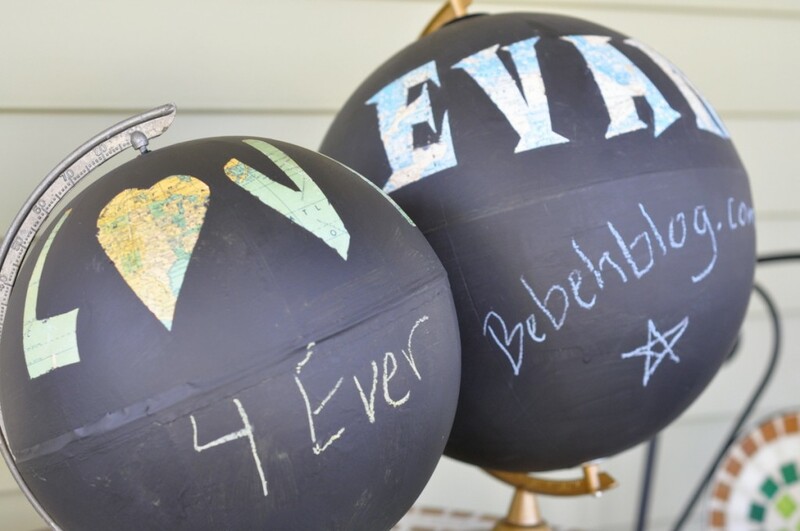 Use painter’s tape to make stripes and then write cute, clever things all around the world. 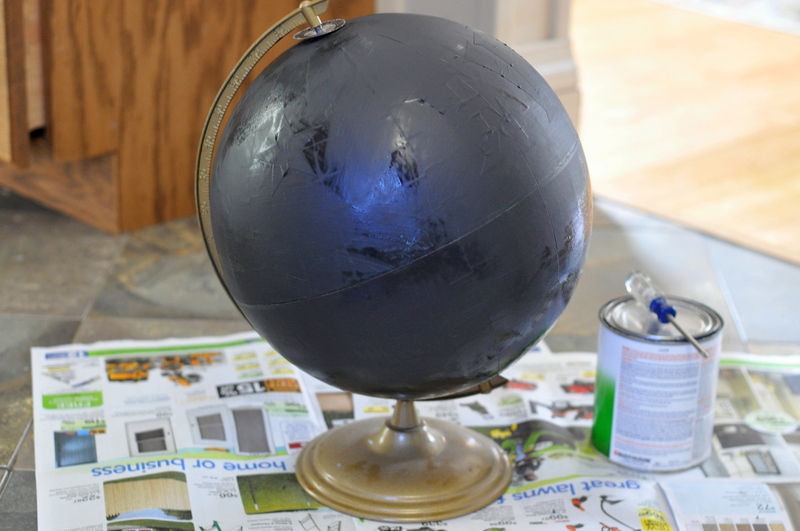 Your creativity is only limited by your access to cheap globes! But hey, even if you end up paying $30 for one at an antique store that’s still a LOT cheaper than $297.50. Yikes. This project is ridiculously easy. Stupid easy. 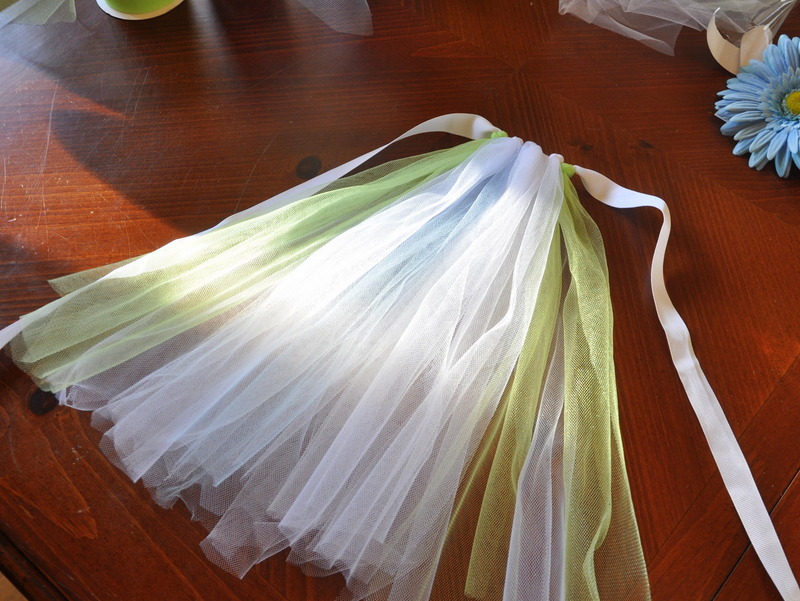 If you can tie a knot you can make a tutu, so you don’t really need my instructions. Also, there are already a billion versions out there. But since you already know how I feel about acting like YOUR tutorial is the most special and awesome and original of all the tutorials ever (and also because I have nothing else to say today)(and maybe because I just want an excuse to post pictures of my baby in a tutu)(plus I was playing with my new lens) I’m going to share my easy no-sew baby tutu project with you anyway. For the sake of honest blogging, I will tell you this version from Plumtickled is where I started when I thought “hey, I’ll just MAKE a tutu instead of paying $22 plus shipping from Etsy!” Her’s was the first that came up on Google. But since it involved sewing I decided it wasn’t really for me. True story, I once used glue to make a throw pillow JUST to avoid sewing four straight lines. And by “once” I mean “last year” and also “that throw pillow is still in my guest room right now.” I will do anything to avoid threading my sewing machine. 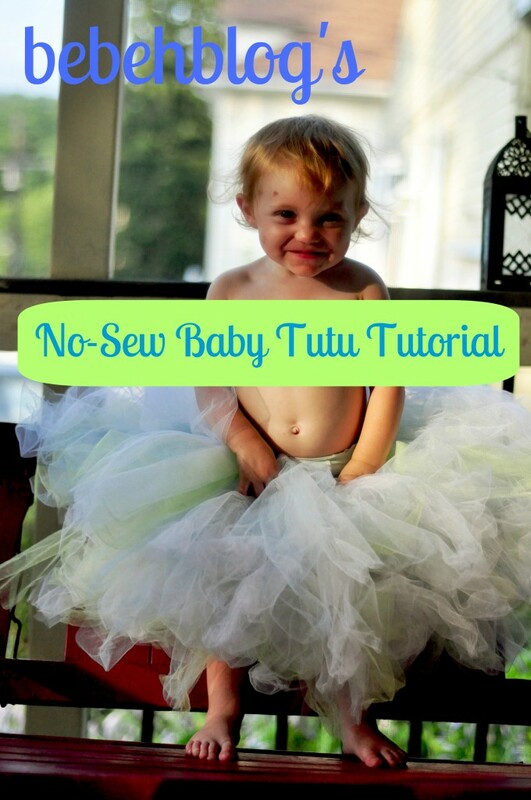 So here are my instructions for the world’s easiest, no-sew, adjustable, one-size-fits-all, infant, baby, toddler and kid sized tutu. 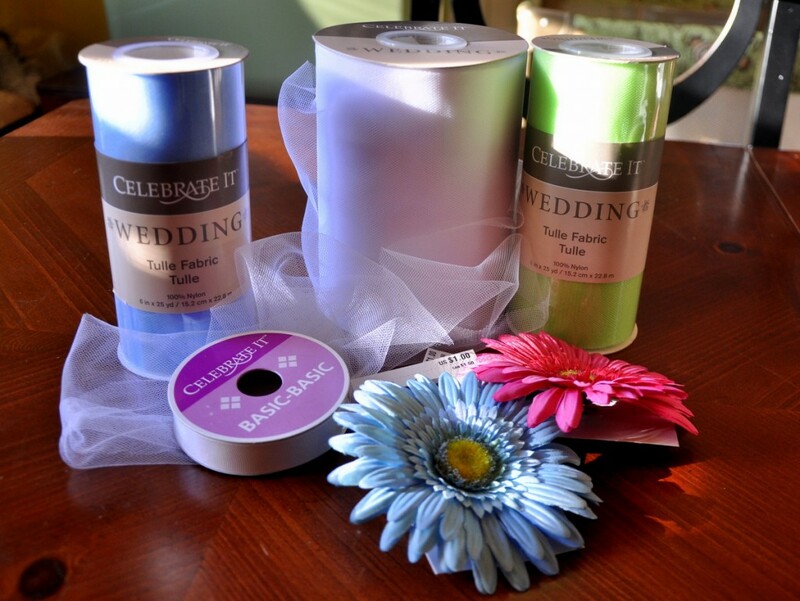 Step 1: Buy some tulle in various colors. 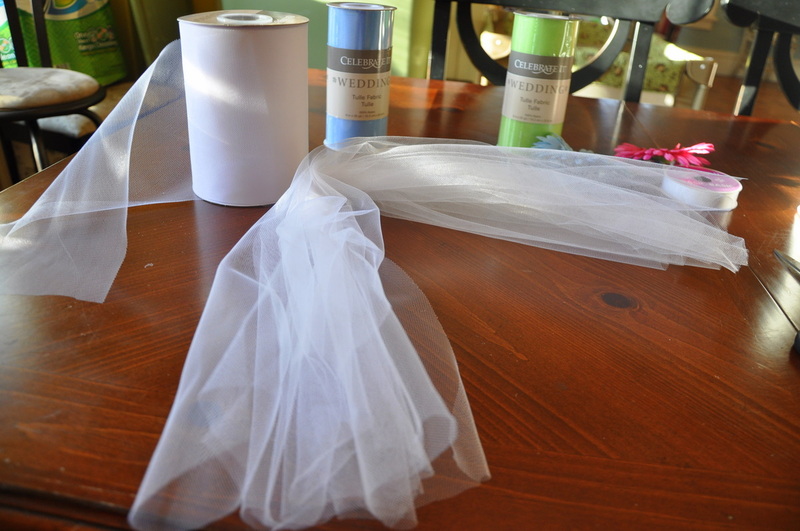 You will not need this much but since the easiest way to avoid cutting tons and tons of strips is to buy the tulle in rolls you can just plan to make several tutus with the extra. 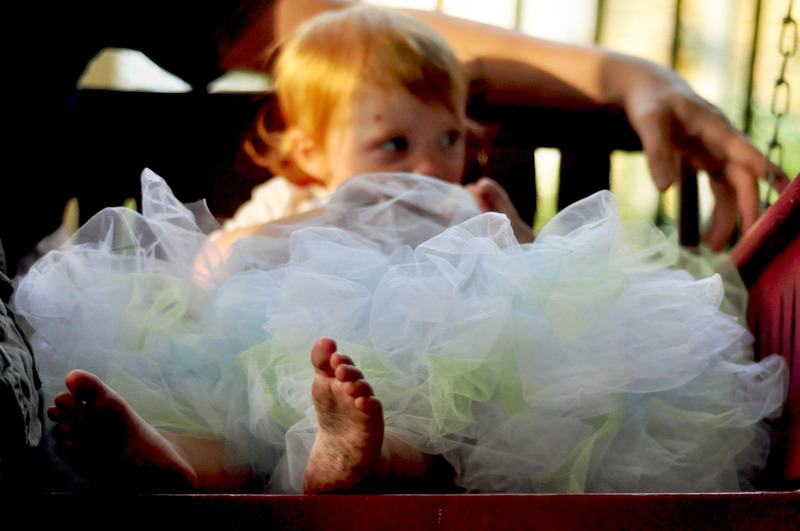 I promise you know someone with a baby girl who would love a tutu. You will also need ribbon and scissors. Total cost: $16 at Michael’s including the flowers for $1 each. Because I’m fancy. 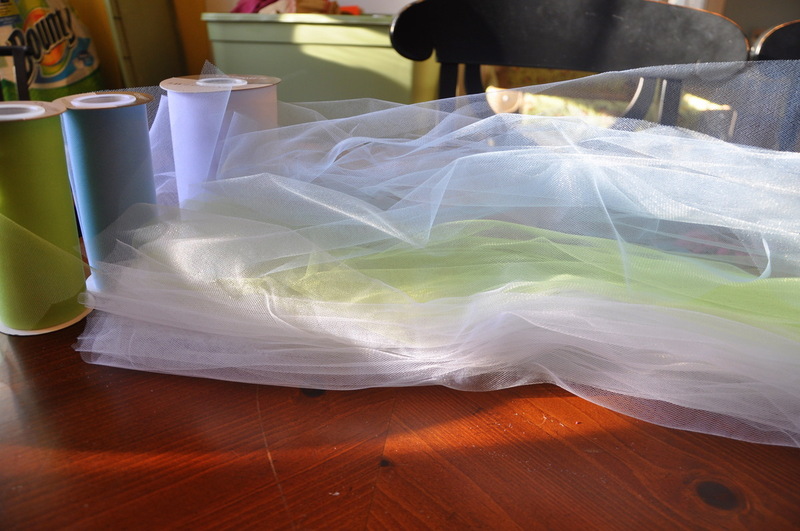 Step 2: Cut the tulle into strips twice the length you want the finished tutu to be. I did not measure, I guessed. 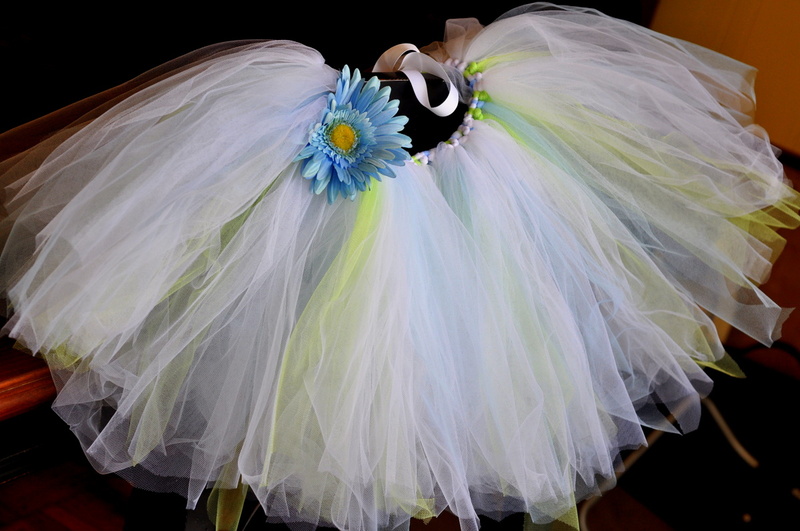 Since my goal is to use this tutu for the rest of the year and beyond I made it medium length. Don’t worry too much about making the strips all exactly the same length. This is supposed to be easy. Cut up some strips in each of the colors you’re using. I did a ratio of about 3 white to each 1 blue or green. Step 3: Cut the ribbon to a nice long length. 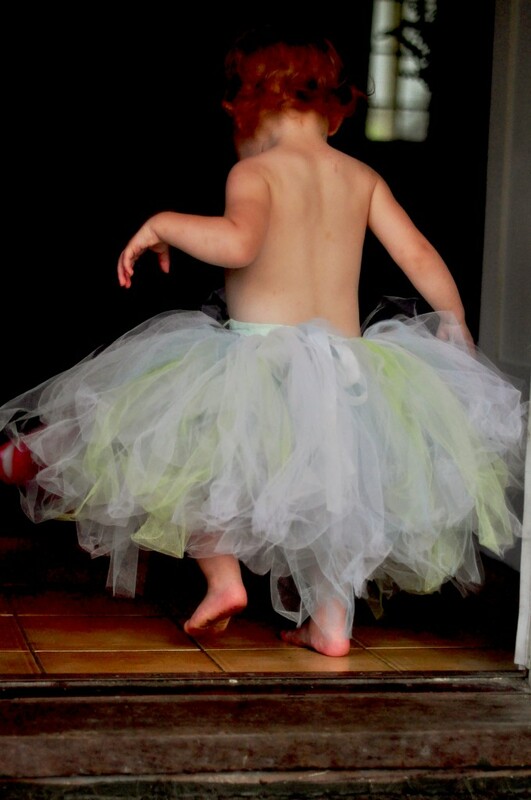 Like I said, I want this tutu to fit for a long time so I actually cut the ribbon long enough to go around MY waist. 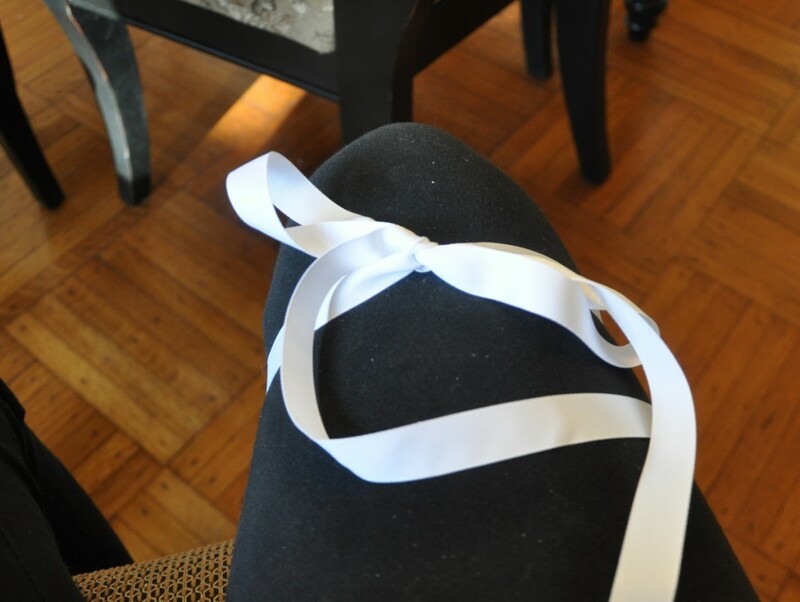 Now tie the ribbon around something (like your leg) to make it easy to work on. 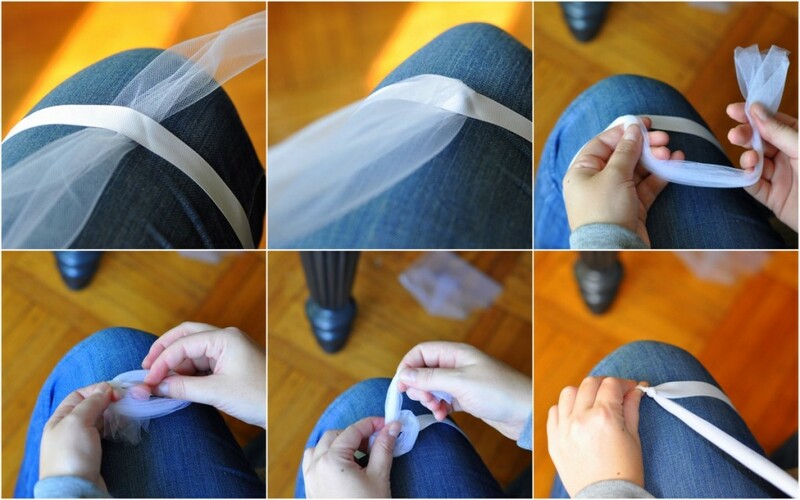 Take a piece of tulle and fold it around the ribbon. Then tie the two pieces into one knot snug up against the ribbon. Some tutorials called this a “double knot” but it’s really just one knot with two pieces of tulle. SEE? MY TUTORIAL IS THE BEST. My thigh works well, because it’s pretty much the same size as my baby anyway. ADDED: Knot tying demonstration. The hardest part is getting the knot snug right up against the ribbon so they all look nice and even. Try to get the knots as tight on the ribbon as possible. It might take a little practice. I have a REALLY HARD TIME being random with my colors (thanks OCD tendencies!!) so I didn’t really try too hard. Every 2 or 3 white ones I put in a blue one, then 2 or 3 later a green one. 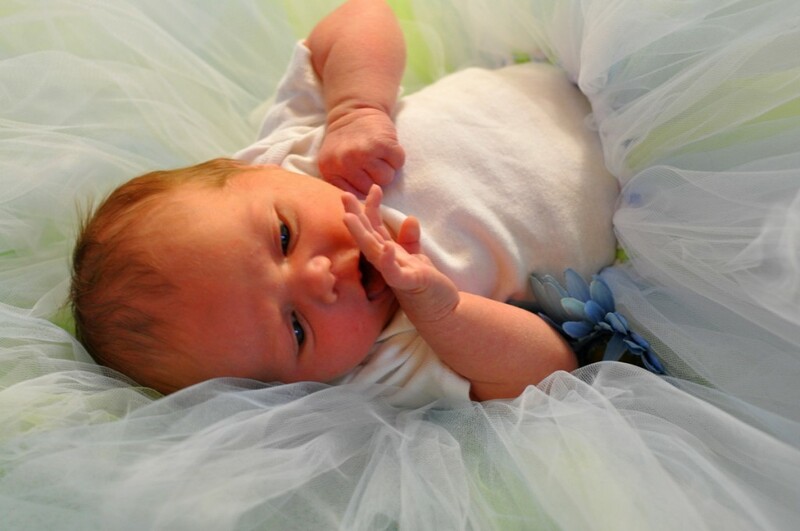 Step 4: Repeat steps 2 and 3 until you’ve tied enough tulle on the ribbon to go all the way around the baby/child you’re trying to be-tutu. You can slide the knots around if you decide you need to add any more of one color in any one area. 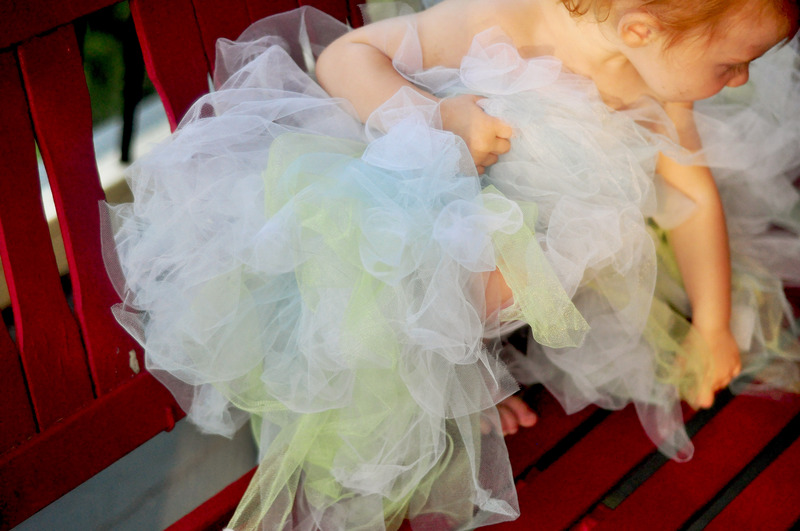 You might as well put something interesting on TV and grab a glass of wine because it might take a while to tie enough tulle to make the tutu nice a full. Trust me though, it’s worth it. The flower came with a clip on the back. It’s like the universe made it especially for lazy crafters like me. 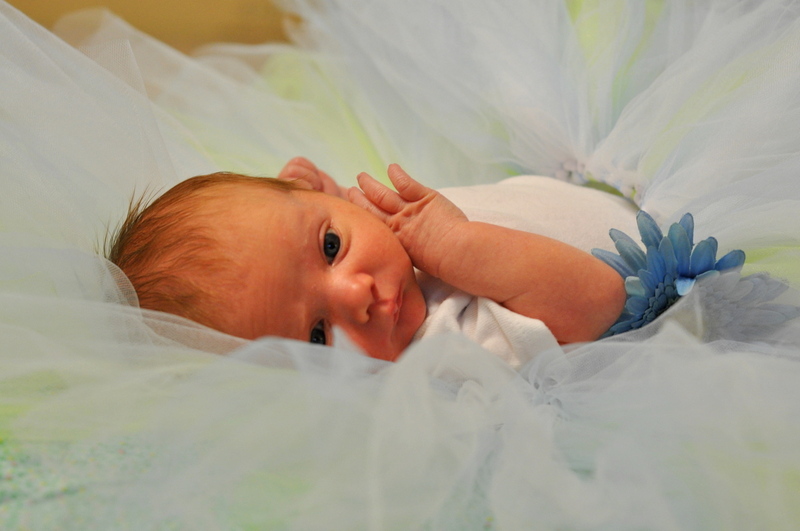 Step 5: Find a bebeh model to model your tutu. Take fourty bazillionteen pictures. And there you go. That’s the whole thing. No sewing, no glue, no fancy cutters or machines or tools needed. Just tulle, ribbon and scissors. 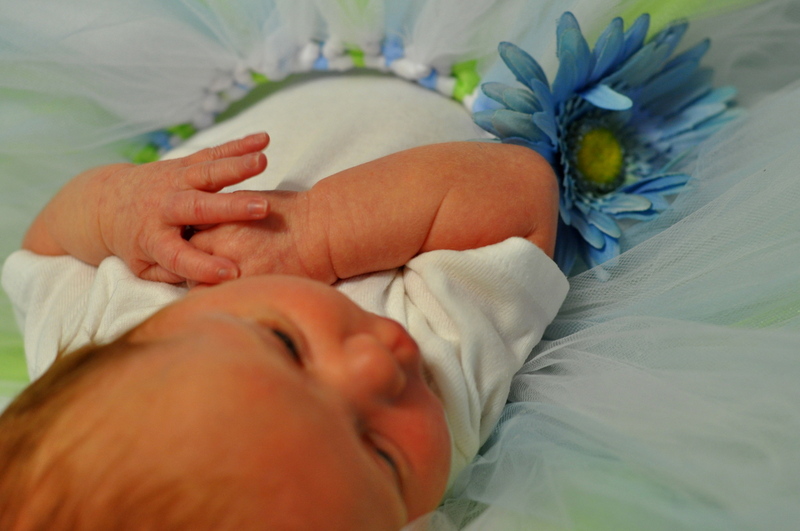 My plan is to cut enough strips now to keep making the tutu bigger as Caroline grows and to use it for each of her month-day pictures. 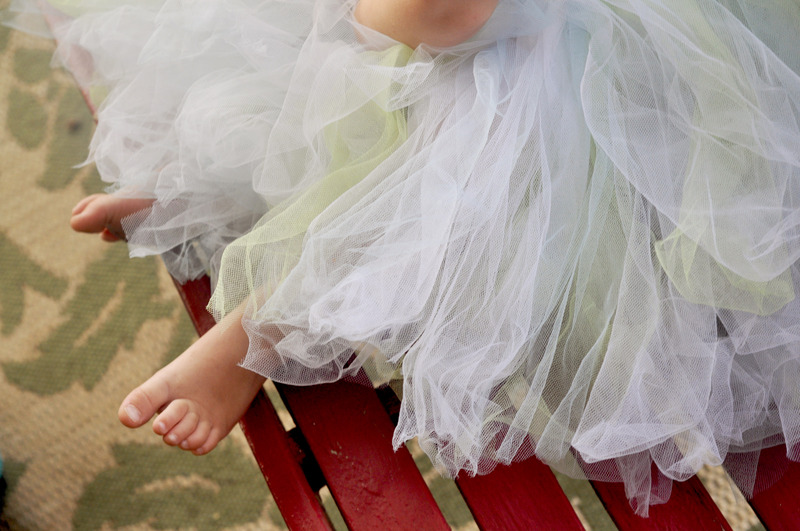 I’ll probably still have enough left over for at least two or three more tutus, especially if I make them a little shorter. 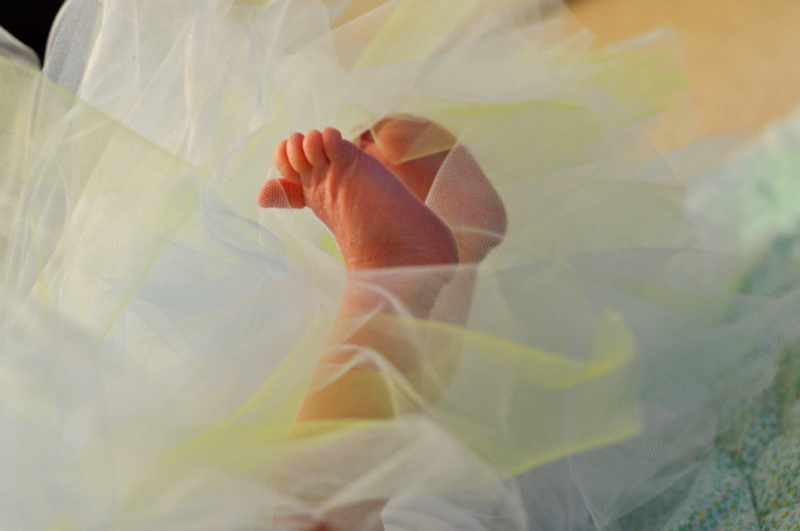 Anyone around here need a baby tutu? I’m willing to trade for Starbucks or yarn. UPDATE!!! Since both Caroline and Evan have beat the crap out of that tutu for the last 18 months, I thought I’d add some “how has it held up?” photos. The answer is: Pretty well! Tulle has a tendency to attract dog hair/lint/fuzz/every single crumb within 100 yards so looking back, white might not have been the best option. But it’s also pretty easy to brush off and/or lint roll and/or spray with a water bottle and shake out. The tulle has gotten pretty tangled from being so well loved (and also stored bunched up in a corner) but can be smoothed out if I comb through it with my fingers. Although the sort of bunchy look isn’t really a bad thing – I feel like it really fits Caroline’s personality. Her nickname is Little Mess. The ribbon waist was a really great idea, since she still fits in it easily. 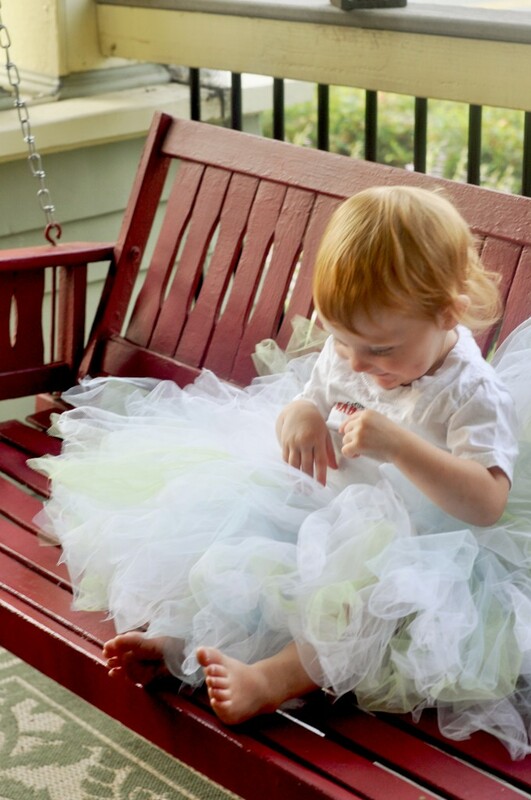 Even though Caroline is still tiny peanut munchkin toddler, Evan has definitely gotten bigger and the tutu still fits him (although her wouldn’t agree to post for pictures). 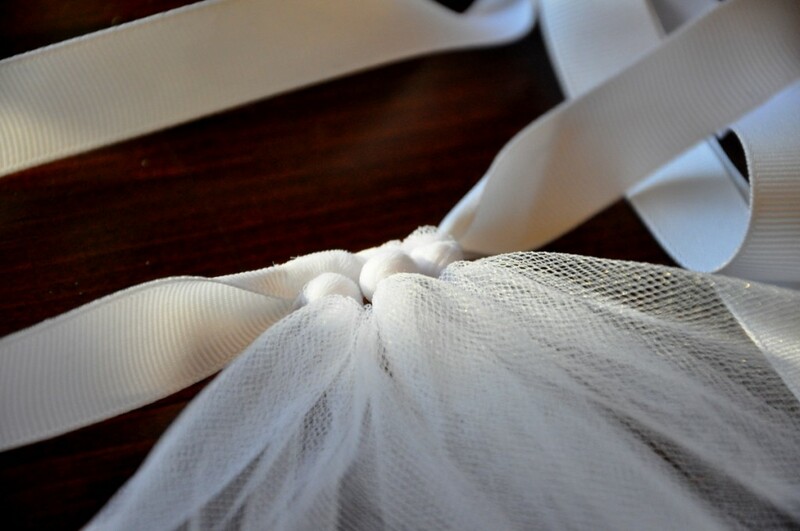 And it’s easy to slide the tulle knots around to make it even. 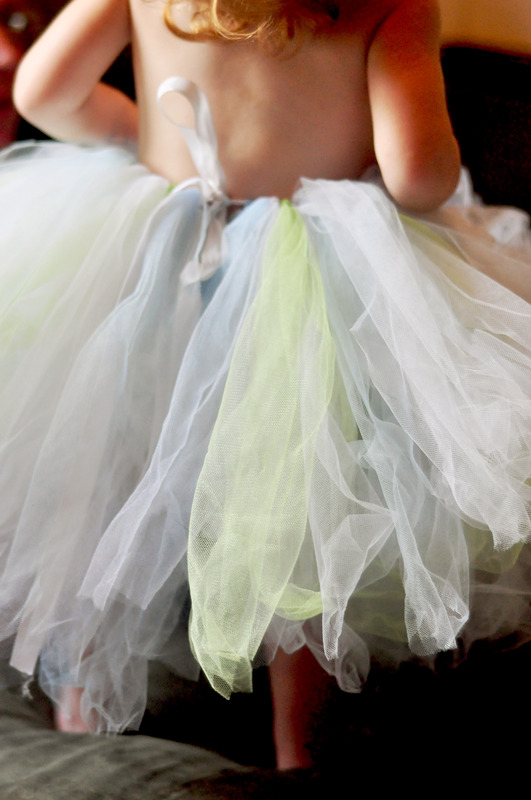 Have I talked you into making a tutu yet?